A hundred steps necessarily begin with one step. At St. Benedict Secondary School this last February 2011 marked an import historical event: the celebration of the first graduation of advanced level secondary school education. The graduating class had only three students: one young men and two young women!! 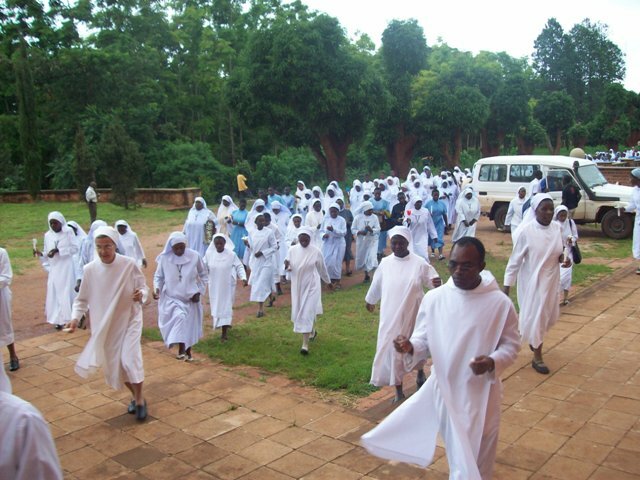 It was a mile stone for the school and for the history of Hanga Abbey in its efforts to serve the community with opportunities of education. It was a great joy to the graduates, teachers and all students at St. Benedict Secondary School to witness this event. We congratulate and thank the pioneer students for enduring and trusting that Hanga can offer the best too. 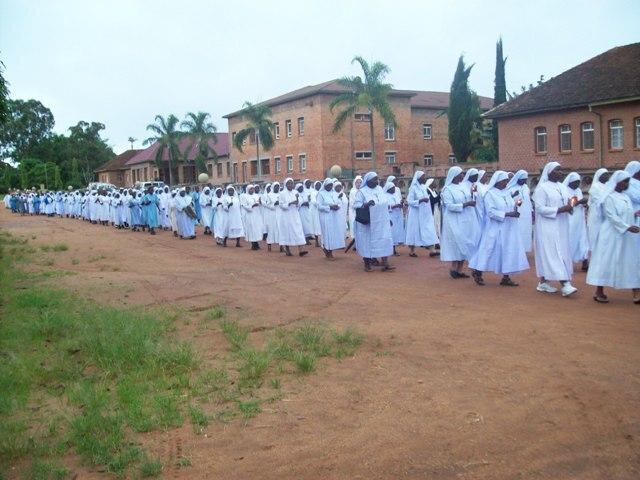 Of the three graduates Clementina Nziku had finished her Ordinary Level secondary education at St. Benedict. The class has opened the doors. No question in the near future there will be more applications for advanced level secondary education at St. Benedict than the school can handle. 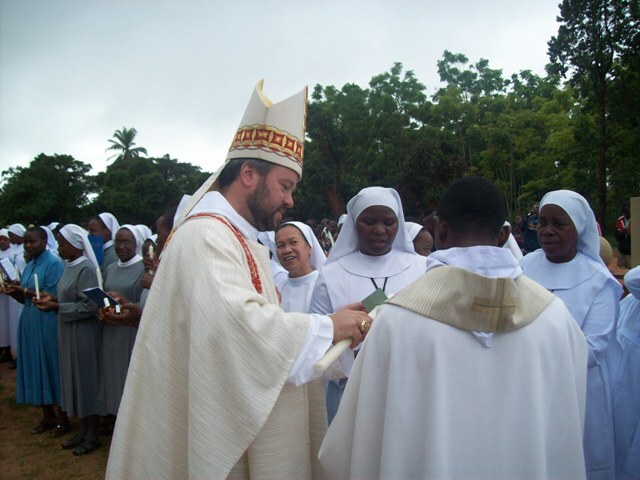 In the photo above Prior Odo Nanyanje, OSB, with the graduates from left Clementina Nziku, Alfa Komba and Mary Mwanyika. In the photo Fr. Mugaga Angelo Mselle, OSB, the headmaster of St. Benedict Secondary School with students the on graduation day. In the photo below left to right: Fr. 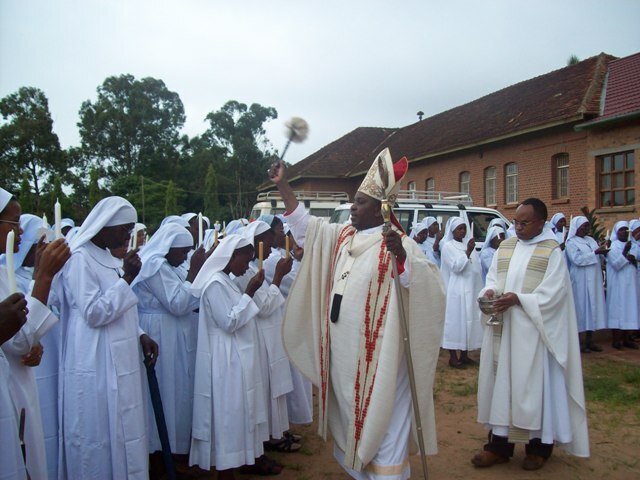 Mgaga Angelo Mselle, osb, the students Clementina Nziku, Alfa Komba, Mary Mwanyika and Abbot Thadei Mhagama, OSB. The three student graduates posing picture with their friends, relatives and staff members. Our reporter Br. Stanislaus Mwinuka, OSB, is in the photo with two of the graudates. On the occations of graduation students enjoy better meals than those of ordianary school days. In the photos students are enjoying the delicacies of beef and beef stew with rice and soda!! Get in line, get your good food, sit down and enjoy!! This last February 2011 a group of men and women, eight in number, visited Hanga Abbey. The group was led by Petra Gehrer from Austria. She is the organizer for travel/tour in conjunction with the program at Hanga Abbey know as Responsible Cultural Tourism. She organizes people to come to southern Tanzania for sight seing of national parks, beaches in Lake Nyasa, and in Dar es Salaam and Zanzibar. Visitors at Hanga Abbey get the opportunity of a day or two to stay with a local family in the village and do daily family chorus including cooking and eating the local food. Come one, come all and enjoy the beuty of the country of Tanzania and the cuture of its people!! 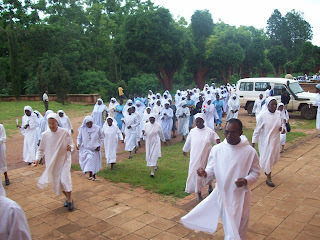 In the photos find the group of the visitors from Austria as they were touring Hanga Religious Seminary one of the different institutions of Hanga Abbey.You can see Br. Lucius Matembo, OSB, our reporter in black trousers, giving tour to the guests. Below the visistors in one of the classes at the seminary talking with seminarians. On February 2nd this year 2011 religious men and women from different religious communities in the Archdiocese of Songea, in southern Tanzania gathered together to celebrate the world day of religious. It is the feast commemorating the presentation of the Lord Jesus when he was child to the temple. 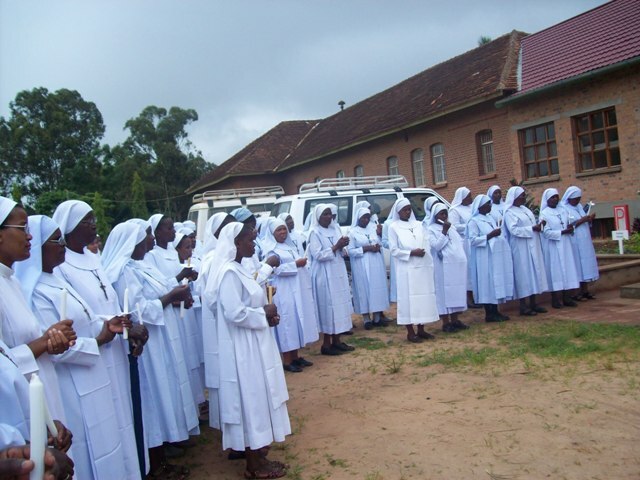 The religious are reminded of their dedication and consecration to life in the service of God and his people. The archbishop is blessing the people with candles. 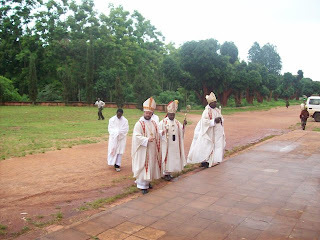 In the archdiocese of Songea this has become a tradition that every year a venue is chosen where all religious in the archdioce gather for the Holy Mass liturgy presided by the Archbishop. It is a way of witnessing the Church in terms of vocations in the diocese and the way of encouraging each other as religious people. 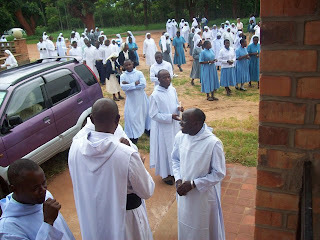 This year's venue was at Peramiho Abbey. 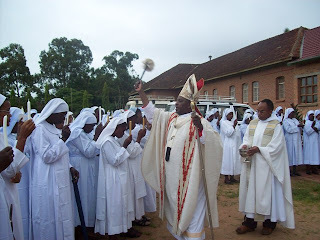 The mass was presided by Archbishop Norbert Mtega and the homily was delivered by the retired bishop of Bukoba who is a monk of Hanga Abbey Very Rev. Placidus Gervas Nkalanga, OSB. From left: Abbot Anastas of Peramiho abbey, Archbishop Norbert Mtega and Abbot Thadei Mhagama, OSB of Hanga Abbey. 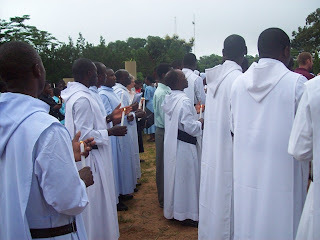 A section showing some monks of Hanga Abbey gather for the blessing of the candles. Abbot Anastas of Peramiho is lighting his candle.